The Regional Universities Forum for Capacity Building in Agriculture (RUFORUM) has witnessed significant expansion over the past five years. From its creation with 10 members, the Consortium now has a membership of 66 African universities with operations across 26 countries on the continent spanning Eastern, Central, Southern and Western Africa, with a vision ‘to create a vibrant agricultural sector linked to African universities which produce high performing graduates and high quality research responsive to the demands of Africa’s farmers for innovations and able to generate sustainable livelihoods and national economic development’. Programmatically, RUFORUM has also evolved to meet the demands of African universities and to ensure that services are aligned to the needs of members. In 2014, RUFORUM signed a cooperation agreement with the African Union to support the implementation of the Science, Technology and Innovation Strategy for Africa 2024 (STISA 2024) and more specifically, the STISA Pillar 1 on Poverty Eradication and food and nutrition security. The Pillar 1 of STISA is directly linked to the Comprehensive African Agriculture Development Program (CAADP) and the Science Agenda for Agriculture in Africa (S3A). In 2015, RUFORUM launched its Strategic Business Plan for 2015-2020 highlighting important new innovations to strengthen business focus and enhance delivery of its mission. 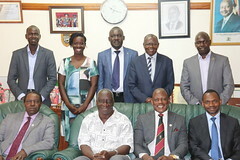 The Plan recognized the evolutionary nature of the agricultural higher education sector and called for greater understanding of the tertiary education sector, including a greater understanding by the network of the university sector in Africa including pipelines from the secondary, vocational and post-doctoral sector. The contextual underpinning for RUFORUM’s work also continues to evolve. New and emerging challenges such as youth unemployment and related agribusiness strategies, the energy crises, climate change, urbanization and globalization all require that higher education systems are realigned to enhance their responsiveness to clients and to ensure that graduates are appropriately skilled for deployment into research and development institutions across the continent. In 2016, RUFORUM received a grant from the MasterCard Foundation. The overall objective of the Project entitled ‘Transforming African Agricultural Universities to meaningfully contribute to Africa’s growth and development’ (or TAGDev) is to transform African agricultural universities and their graduates to better respond to developmental challenges through enhanced application of science, technology, business and innovation for rural agricultural transformation. The Project is expected to lead to economic growth and development and sustainable livelihoods in Africa. This project will contribute significantly to efforts aimed at escalating skilled human resources and capacity to meet the AU Agenda 2063 as well as other frameworks such as the STISA 2024, S3A and CAADP. The Program will extend the reach of the university into marginalized communities and provide transformative education that will develop the leaders and innovators to drive sustainable and inclusive economic growth in Africa. The TAgDev Program will undertake four broad activities: 1) Pilot a new model of agricultural education at early adopter universities that connects tertiary agricultural education to rural communities, with an emphasis on smallholder farmers; 2) Strengthen agribusiness/entrepreneurship at two universities and selected TVET institutions; 3) Scale the new model for agricultural education to other agricultural universities and TVET institutions; and, 4) Increase collaboration and mutual learning among institutions and agencies implementing and influencing innovative Tertiary Agricultural Education for rural transformation in Africa. Within the RUFORUM constituency, there is clear recognition of the need for greater analysis, understanding and reflection of the tertiary education space to guide development and optimization of strategies required to achieve RUFORUM vision and mission, including informing its business plan. Trends at the global level, and indeed continental and national levels continue to evolve and yet analyses are usually inadequate. A few recent publications have been particularly useful to provide important information on the agricultural and higher education sectors. For example, the recent book on “Agricultural research in Africa: Investing in future harvests” which was published by the International Food Policy Research Institute through its Agricultural Science and Technology Indicators Program provided important information on ‘key strategies to address current limitations and inefficiencies in agricultural R&D financing, human resources, organization and management, and systems-level structuring for continued growth’. The focus was broadly on the agriculture and innovation with a chapter dedicated to capacity building efforts in Africa. An earlier book sponsored by the World Bank on ‘Cultivating Knowledge and Skills to Grow African Agriculture: A Synthesis of an Institutional, Regional, and International Review’ provided analysis on the need for skills in growing agriculture in Africa. However, it is close to a decade since the World Bank book was published, it is necessary to further review and provide a more up-to-date analysis and opportunities for investment in Africa’s agriculture. RUFORUM is thus leading an effort to bring together partners including TAE stakeholders to engage to prepare a document in update of the 2007 above publication from the World Bank in order to form a more solid basis for the launch of a collaborative effort suggested in the three points above. The MasterCard Foundation and the World Bank have both clarified their intention to partner in the effort. Consultant(s) are required to support the overall book development, playing a key role as its editor(s). The overall objective of the assignment is to guide the overall process and support the development of a book on tertiary agricultural education in Africa on behalf of RUFORUM. Provide through separate arrangement the services of an communication editor to work under the supervision of the Consultant. Experience in editing at least 2 similar publications. The task is expected to take a total duration of 45 person days during the period February 2017 to 31 January 2018. RUFORUM may consider more than one consultant to undertake the task.